I’m proud to announce that I was honored with a “Best in Glass” award at the Contemporary Hispanic Market in Santa Fe this year. This is a wonderful show that showcases contemporary artwork by Hispanic artist in New Mexico. My ecoBottle cheeseboards are now selling at Arlene Prescott Collectables in Santa Fe, NM. This great eclectic boutique is one block from the Plaza. 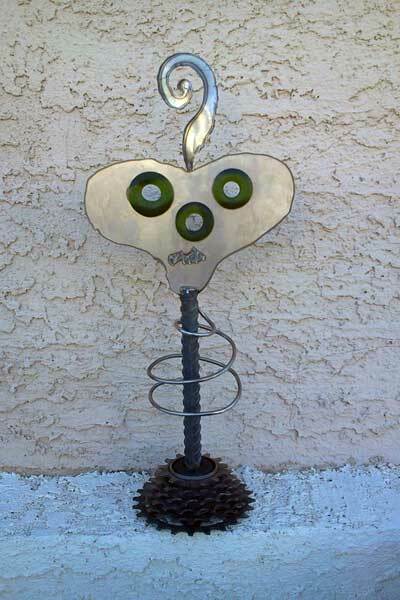 Along with handmade clothing, she also features unique functional art. If you are in Santa Fe, stop by. The address is 206 E. Palace Ave., Santa Fe, NM. 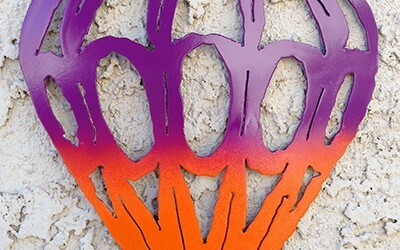 New to my line of recycled work are Hot Air Balloons. Check them out in the Gallery and the Shop. I’m having so much fun creating these balloons. To come, will be balloon magnets and ornaments. Also, the “Caritas” (little faces) line, is evolving. These are very whimsical little wall hangings. Stay tune for more of these creations. My Day of the Dead characters are continuing to evolve. Check out the 4 new characters in the Gallery and the Shop. I’m having so much fun creating these characters. Stay tune for more characters and other Day of the Dead creations. I’ve been working on a new series for my metalwork. Since I moved to New Mexico, I’ve been intrigued by all the artwork attributed to Dia de los Muertos (Day of the Dead), which is very popular here. I’ve come up with my own version of Day of the Dead. I’m enjoying making these whimsical characters. In creating them, I have found, that as one is taking shape, it reminds me of an old TV character, book, or personality. I’m having fun creating them. I will post more soon. To look at the new work, click here: http://kaleidoglass.com/gallery/ then click on “Metalwork”. Drum Roll please!!!!!! I would like to introduce my new website. I’m very excited about this site. it now incorporates all my art passions: lampwork glass, metalwork, fusing, and recycling. Jessica Reilley, from A Mix of Pixels, did a fabulous job in designing the site. From conception, she really listened to everything that was important to me. She really translated everything that I wanted into this beautiful site. Jessica, I can’t thank you enough. Soon, we will be starting the second phase of the site… the Shop! So stay tuned. More to come.